Energy efficiency was a priority when planning my home and geothermal heat pump and radiant floor heat was the heating system that would fit the bill. Geothermal heat pumps have a very high efficiency rating of 300 to 400 percent which will cut down the impact on the environment and save money as well. But there is one catch,my research showed, geothermal heating system can be a very expensive system to have installed. Radiant floor heat requires a geothermal unit that could heat water that can be circulated through the floor. These unites are known as water to water geothermal heat pumps and there are two basic ways these systems can be designed...closed loop or open loop systems. Closed loop systems require burying a network of pipes in the ground, placing loops of pipe in a large pond or lake or drilling a series of holes to a depth of 300 to 400 ft and then placing a looped pipe in the drilled holes and back filling the drilled holes. You can see where this could be quite costly. A mixture of water and a special antifreeze is then pumped through the pipes extracting the heat from the ground and then pumped through a coil in the heat pump where the heat is extracted. The cooler mixture is pumped back to the ground loop where it is reheated by the ground to be reused again. A open system..uses water pumped from a well or other clean water source. After the heat is extracted by the geothermal heat pump the water is returned to the ground by means of a well or dumped in a near by water way. Where law permit it can be dumped on top of the ground. This method appeared to me to be a much simpler and less expensive way to go. Since I would require a drilled well for my domestic use all I had to do was to make sure I had enough volume of water and pump capacity to handle the load. As far as what to do with the water when it left the geothermal heat pump.... well.. in my neck of the woods we are allowed to dump a maximum of 10 gpm and the heat pump only required 7 to 8 gpm...problem solved. As I had mentioned earlier when checking around I found that the installation by a contractor was going to be very expensive...(everyone has to make a living). So my alternative was to do it myself. The installation was a breeze and the unit works excellent and the cost of heating...well... when compared to a neighbor whose house is a few sq. ft. smaller than ours, our heating cost is a third (1/3) the cost of his. If I was not able to put the geothermal unit in myself, I probably would have had to go with another type of heating system...the installed prices were way over my heating budget. By doing it myself I was 10,000 dollars under the lowest quote I received. 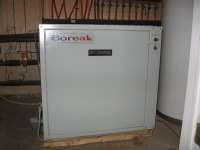 In some provinces or states, there are rebates available for environment friendly heating systems. 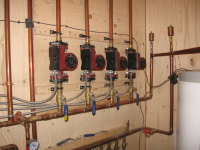 This is something to be considered if you are planning this type of heating system.